It took me forever to find the bandwagon (I’m not a big electronic music person), but I finally jumped on board. I love Daft Punk’s newest. It’s absolutely wonderful. The musicianship is incredible. And the mastering engineer wasn’t too bad either. Enola won’t win any awards for mastering or production (some songs sound better on laptop speakers than through the car); however, the songwriting is rich, complex, and mysterious. “Lions” remains one of my favorite songs of the year. “Ancient Crows” and “Adaptation Cell” are also worth checking out. I still hate the title. But the music is exquisite. Yes, exquisite. The album slows down towards the end a little too much for my liking. However, it’s great to see growth in their musicianship and songwriting. Side Note: Megan and I saw them in Rochester this year and they were delightful. Admittedly, I’ve only heard this EP a few times online. But I do plan on purchasing it soon. I’m a big (no, HUGE!) Glen Hansard/Swell Season/Frames fan. So yes, he could probably just yodel for thirty minutes and it would make my best-of list. The value of film Hollywood churns out seems to be in decline each year (coughManOfSteelcough). There will always be good indie films and documentaries. This section is dedicated to the mainstream. I’m not surprised this movie didn’t resonate with US audiences (still recovering from Battleship). The trailer looked arguably dumb. And I just didn’t care for another monster from the ocean/mass destruction plot. A friend reminded me Guillermo del Toro was behind the wheel, and that Mr. del Toro deserved the benefit of the doubt. My friend was right. I highly recommend it. Yes. You’re reading correctly. How despicable. What can I say? It made me laugh! Oddly enough, I enjoyed this movie more than Monster’s University (which surprised me). So I like kids movies, big woop, wanna fight about it? I randomly saw this film in a $2 theatre without knowing anything about it before hand. Considering so, I’m sure critics and people smarter than me didn’t care for it. But without high expectation or high opportunity cost, Now You See Me was great. So go see it! It’s even cheaper now (Redbox anyone?). I think I have super hero fatigue. The movie market (and my brain) is saturated with capes and masks. That said, Iron Man 3 was pretty good. Some say 3 was better than 1, I disagree. We saw Iron Man 3 at a Drive-In in California during winter. So there is always that influence. Everything is happier in California… and warmer… and I’m rambling. My favorite movie of the year! Hands down. I haven’t loved a movie this much since Eternal Sunshine. Depending on how Walter Mitty holds up after a re-watch or two, it will probably make my Top 5 movies list. It’s also worth noting that I’m NOT a Ben Stiller apologist. However, he hit this one out of the park. PS: Catching Fire isn’t in this list. It should be. I loved Catching Fire! One of my favorites of the year, for sure. Maybe when I have more time I’ll officially add it. PPS: I haven’t seen The Hobbit yet. You can blame my wife. There aren’t very many 2013 books here (actually none). Never fear! I read a bevy of older material this year. They are new to me, and that’s all that matters so BACK OFF. 2013 was the year I finally read Hemingway. Damn fine. Damn fine. “The Sun Also Rises” is great, too. His short stories, however, made a larger impact on me. “Snows” is a collection of shorter tales that challenged my perspective on what the short story could accomplish. I read it in high school and hated it. I reread it this year, and I couldn’t put it down. Maturity, I suppose. I don’t have much to say about it. I read it after I read Hemingway, so Fitzgerald’s poetic nature was very much appreciated. Great book. There were a couple moments I had to sit the book down and laugh at it’s splendor. Another oldie. I’ve been on a King-kick for about a year now. I read this one earlier this year and it gave me chills. If you’re looking for a good (shorter/low commitment) King novel that will scare you, look no further. It’s one of my favs. I remember watching this movie as a kid and being blown away by the intricacies of the plot. I re-watched it after I read the book and almost hated it. Regardless, Sphere is a great book. I found it in a thrift store and couldn’t put it down. I hope to read the other Crichton novels next year. I highly recommend it! I can’t even get into this novel right now. So good. I love to be challenged, especially from a Christian perspective. But this book is about more than any one religion. I love the macro thoughts on faith and earning your own way. No one can give you God but God. Great stuff. I grew up in a home that was built by a semi-popular guy in the 30’s. Steinbeck visited him every so often. It’s about time I read some Steinbeck. I had to read this for class in a week and it was Hell. However, when it was over I felt emptied. This book did something to me that can’t be described. I plan on reading it again at some point. Quite wonderful and tragic. 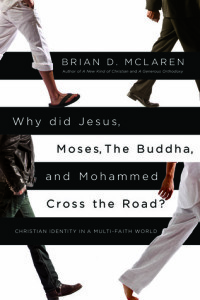 Brian D McLaren-Why Did Jesus, Moses, the Buddah, and Mohammed Cross the Road? Reading a Brian D. McLaren book is very similar to eating an entire lemon marring pie by yourself: it’s sweet at times, troubling at others, a lot to take in and hard to finish. With that being said, his latest venture into disrupting the Christian status-quo, Why Did Jesus, Moses, the Buddah, and Mohammed Cross the Road, is most likely the best book on theology I’ve ever read. My full review is here. Welp, that’s it for now. What were your favorite movies, music, and books of 2013? What are you looking forward to next year? I just made a Spotify list of “Top Story Songs – 2013”. Jason Isbull is my favorite, along with Kasey Musgraves, Ashley Monroe, the Avett Brothers, and Josh Ritter. It was a good year for music. Tony, thanks. I’ll have to check it out. I love the Avett Bros, but never got a chance to check out the new album. Steinbeck is glorious. He leaves me with an almost-melancholic wonder that really is indescribable. If you never have, you should pick up his other books. Of Mice and Men & East of Eden I’d definitely recommend first. Really liked this post. I’ll have to add to my reading list for this year. Hey, thanks! I plan on reading “Of Mice and Men” pretty soon. I’ve heard great things. Just rewatched Pacific Rim a few days ago. It’s almost too good.